Nintendo of America's third-party relations and indie development boss Damon Baker has revealed that the company is currently pondering the idea of "Early Access" games on its consoles. We don't have anything to announce, but I can say that we're certainly exploring options and capabilities. So anything is possible. I guess the important part of it is we're very conscious of it and definitely looking at it. 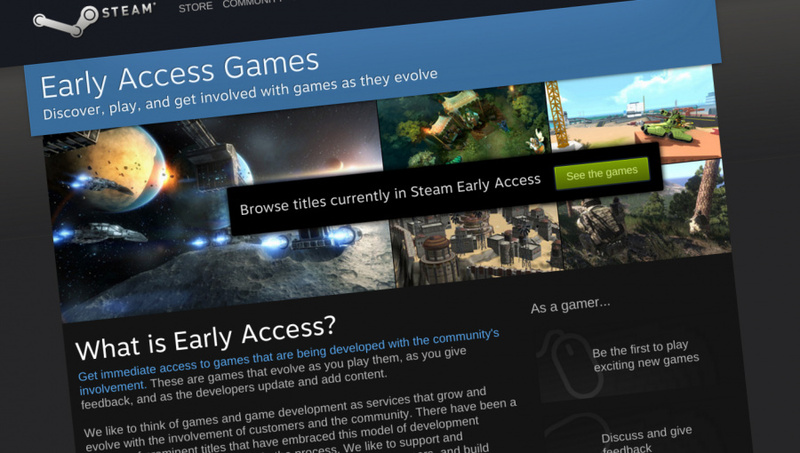 Early Access is something that Valve's PC-based Steam service offers, allowing gamers to help fund projects that might not otherwise get a release. Titles launch before they are completed and players purchase them at a reduced cost. The reward for the consumer is getting an early sample of the game and helping shape its development. We had to change policies over this, guidelines. I mean we basically created almost an early access-type of situation because some of this content isn't even coming out until towards the end of the year. So to be able to give such early visibility to some of the developers and these builds, there was a lot of work that went into it. Both Microsoft and Sony have already expressed interest in similar programs for their consoles. Would you like to see Early Access games come to the 3DS, Wii U or NX? Let us know with a comment. If done correctly, it could be interesting. They should call it Nintendo Pre-Play and make sure that a trusted 3rd party publisher/management company is keeping tabs on these projects. Let's be honest: knowing Nintendo this would only ever become a thing next gen. So we're really just talking NX here at this point. And YES, I would want to see this and any other advantage Nintendo may be able to have going into next gen. I'm not a huge fan of Early Access, but I can probably see myself trying them out if there's some really good games. I think early access has it's place, but maybe not on Nintendo consoles. Steam, Xbone and PS4 all get fairly high profile indie games. Stuff that has a buzz around it years before release, because it's by the same team that made some previous critical smash. Games like Massive Chalice work in Early Access as people are willing to pay for an in development game from Double Fine, or Tacoma, because it's the Fullbright Company. How many times has an anticipated indie game like that debuted on a Nintendo console? I can only think of Shovel Knight. No thank you. I want the game when it's finished. Amazing 5 years ago you were paid by companies to beta test their games. Now YOU PAY THEM to beta test their games. Playing the next Zelda game could be really nice as I like to see how that goes in the end! I don't much see the point and I don't think it fits a big gaming company at all but hopefully they know how to implement in a good way and it amounts to nothing more than a little experiment. Also, what advantages would there even be to this? I don't think it would help Nintendo but we'll see. Boy do I hate early access games almost as much as I hate free to play games. Although this might be a bit of a touchy subject for some of us: if done in the same way as Project CARS, where the community actually helped to improve the final game by playtesting and giving feedback, this could definitely be beneficial to all parties involved. Early access could do a LOT to iron out kinks and remove bugs before a final version is published, so if done right this isn't something that you should be against.. Early Access is not something we want on consoles. It is already a mess on PC with so many games never getting finished. And once they do get finished teh community does of really fast cause everyone already played the game too much. There are some good exceptions to this but not enough. Sadly, no amount of disclaimers will stop certain kinds of people from complaining about their unfinished game not working correctly. Letting the developer know about a problem is one thing. Acting like it shouldn't happen like it's a finished product is completely another. I generally avoid early access, but two games have caught my attention that come from developers that seem to have every intention of finishing their game. So I might dabble in the near future. As for Nintendo doing it...eh, guess it depends. But ALL forms of early access really need to step up on accountability. Maybe they should explore making their online services actually competitive first. Just did my first one with 7 Days to Die and if they're of that caliber, yes. Even in its beta with all its issue the game is just too fun. Makes me excited to see the final product. Like Steam it also needs a discussion platform but I guess Miiverse would work well for that. The developer has really listened to the users and it just keeps getting better. As said before, if done right this could be a great move. To some comments, the key difference between this and kickstarted is that there is a playable product that a user gets immediately (usually). Buying early means more problems of course but down the road in the beta stages it could be a gem before it's even done. If I could choose between this and kickstarter, I'd choose this since I can see the product and not hope it will happen (Project CARS what?). To be fair, I don't think this would work for heavily story driven games for obvious reasons. Also if the content is shallow then early access would ruin its chances of post release sales. @Parasky I agree with you. Before implanting something like early access architecture, they should begin to work on a solid online framework. right now, put aside miiverse and cross platform wallet, having a nintendo network ID isn't much. but I'm also pretty sure nintendo would handle Early access pretty well. Early access huh? Isn't that what Splatoon is? I think early access can ruin a games chance of success, if the early access is done poorly. Even if the final product is amazing, if the early access was done poorly it can leave a bad stigma surrounding the game. Really? Early Access? Or, to put it much better, Early Ripoff - the very idea of Nintendo actually supporting this act of undeniable laziness is just sickening! Never pay a developer until the game is done, simple as that. If they don't outright cancel the project during Early Access, they just add new stuff as DLC or pre-order exclusive just to wring some more cash out of the gullible crowd that is giving a developer money for doing their work (a laughable concept by itself already)! I don't mind early access myself.....but your experience with it is heavily reliant on how careful you are and how much you're willing to put up with. I've bought some early access titles that were still great experiences even in an early state....and it can be nice to involve yourself in a community around a game that's still developing. It's not the kind of thing people should be getting into if they don't have a tolerance for bugs and issues. It should be obvious but it's also not something you should get into if you're uncomfortable playing games in an incomplete state. That said I feel like Early Access is something that only really makes sense on the PC platform. I feel like having Early Access on consoles increases the danger of the idea being abused. No, I will never buy a demo or alpha software to help fund completion. Well, never say never, but it's hard to imagine something so cool that it would appeal to me and yet not already be funded. If you want to fund a project get some financial backing, don't try to sell your demo at full price and promise a finished game "someday." I like how "exploring" means Nintendo are instantly going to take this up as their main focus now and aparently become the new EA. Or you know...we can calm down? oh please don't...this is just another cash-in for publishers. Okay after reading some of the comments here I have made a list of things needed to make this concept work for all. 1 the developer must be backed a respectable company who can help with managing the project. 3 make communication with the players mandatory and iron out any bugs that they report. 4 Introduce a strict and rigourous pricing structure to refelct the nature of Early Access i.e no more than a £1.00 or just make it Free of charge and add a donation button. 5 Run regular copyright checks on the material used in the games to avoid any unnecessary court cases. 6 Ban/blacklist developers and publishers who abuse the system without warning then name and shame them. Some types of games thrive with Early Access and the developers get a game closer to what consumers want and the release has a community of supporters. Other games make more sense to go the traditional route. If Nintendo 1st party developers wanted to go early Access I'd be all for it because they would have a good reason, I'd expect. In all honesty people have complained for days on end that Nintendo need to communicate with their fans more. Maybe this could be the start of clean communication? judging by steam's early access, this is a horrible idea. I am not sure of "Early Access" ala Steam is a good idea, but providing it like they did with the "Nindies @ Home" bundle does make sense. Much like the Humble Bundle, I would have never given any of those games a second glance but now a few of them (and their developers) are on my radar. @XCWarrior Even though I'm in full support of Splatoon, Splatoon is basically an early access game till August. @DThrow_UAir Never compare any company to Steam. Steam is slowly becoming a breeding ground for games like Meme run to thrive. Even EA shovels out better games! This is something to consider for the NX, not the Wii U (of course). No no no no no no please. Oh god no. The whole point of early access on PC is that you can tweak files and use mods most of the time. Having it on consoles is just an utter rip off and even more of a blatant excuse to sell unfinished games. All I read was "Nintendo is Exploring the Idea of Releasing Unfinished Games for Purchase"
Shoudn't they start w/ something easy like demos first? Seriously how many Nintneod games get demos? Almost none. Which is absurd b/c so many of those game demos already exist - go look at any in store kiosk, about 6 demos, but none of home consoles. Splatoon even has 1. But they want to start Early Access? Crawl before you walk Nintnedo. Edit - I'm not opposed to the idea, just spent $15 on Lego Worlds on Steam, just that I think Nitneod needs to take baby steps first. Who is encouraging this? Seriously, I'm genuinely curious. If it's free, then I guess you could look at it as a demo, but if you have to PAY to be, basically, a beta/alpha tester? Nope. I will never support it. Not a fan of this im afraid i dont want to be negative but i dont like it. I've only got bad experiences from early access. no no no no!!! we (pc gamers) are trying to kill it on steam NINTENDO MUST NOT JOIN THIS STUPIDITY! Oh gods it's spreading like a virus! @Peach64 Shantae & the Pirate's Curse as well as just about any WayForward game. No, this is a bad idea. As someone who is starting to become more of a PC gamer, early access programs are pure cancer. When Nintendo does it, I imagine many Nintendo critics being hypocritical and defending Nintendo over it because "it's okay when Nintendo does it" as they see it as Nintendo trying to be "competitive". No. We don't need Early Access on consoles too. So many games are left unfinished, or the final product is barely different from the supposed "alpha" build. For Early Access to work, developers need really good communication with players, and the ability to patch and update games super-fast. As in, when a game-breaking bug appears, a player discovering it needs to be able to tell devs about it as fast and efficiently as possible. The devs then need a way to tell all the other players about the bug so they know to avoid it and that it's being fixed. The devs then need to fix said bug and apply a patch live to the game. And finally tell players the bug is fixed. As beneficial as Early Access can be, it usually just results in a flood of crappy games being released. If Nintendo is going to pursue an Early Access program, they are going to have to heavily supervise it. Eh, not sure Nintendo's consoles are the right venue for this. A lot of people compare early access games to already completed games and give plenty of negative reviews on them. I've seen this already everywhere on Steam. The point of early access games is to give feedback and not say they are crappy. When you do that, then of course the developers are going to stop working on it. Reviews like "there are a lot of bugs that prevent me from playing" don't help, state what the bugs are and how they can fix them. The problem isn't how it's necessarily done, but the people who actually review them. Most of whom who probably think early access games are terrible. I think it depends on the game. Spatoon worked fine and that was almost like an early access with the demos and adding more content later. But early access Zelda would probably take away a lot of the fun and exploration in a full game. By the way, I'm not sure I'd consider the [email protected] previews to be early access. I suppose it's similar, but the thing is, most of those games are already complete games like Freedom Planet. That was just a preview of a Wii U port. I feel a good, finished product is worth waiting for. Perhaps that's just me. Before Nintendo looks into early access maybe they should think about improving their online networks for the Wii U you and 3DS. Like Online friend envites, party chat, join friends between different games, and chat between different games. should be more of a priority for the Nintendo network . I was expecting this to get much more of a flood of comments, honestly. No thanks, I'd much prefer to wait and play the finished game instead of paying to try an early build that might be buggy. However, more free demos would be awesome. Early Access always has been and always will be a terrible idea. If you want to sell your product, finish it first. I'm not going to pay to be a beta tester. Nintendo needs to work on catching up with the rest of the industry in ways that benefit the gamer, not harm them. Competitive multiplayer in games that should have it, voice chat, a proper message system, cross platform accounts that allow for cross buy and cross save. Good things. The last thing the game industry needs is more developers being allowed to sell unfinished crap to unsuspecting consumers. @MrGuinea "A lot of people compare early access games to already completed games and give plenty of negative reviews on them." As well they should, because Early Access games cost money and if you're charging money for your game, you deserve every bit of criticism leveled at your product. If all these devs want is bug testers for their games, they should offer the games for free (or better yet, hire people to bug test as traditionally happens in gaming. don't force people to pay to become your employee. can't hire anyone because you're an indie? too bad then, either offer it for free or test it yourself. there is no valid excuse for charging people to beta test). But no, when something costs money, the focus of any review should be to tell other people considering a purchase whether or not the product is worth their money. Completely forget about the developer, the one and only concern on any reviewer's mind should be "is this product worth the money?" And maybe if developers finished their games before charging money for them, the answer wouldn't be an immediate "no, this is unfinished, buggy garbage. do not buy". Early Access is a stain on the game industry and needs to go away completely. It's an insanely anti-gamer business practice. Early Access is a bit of a trap for both the player and the developer. For the player they are paying for a game that isn't finished and likely many will be dissatisfied with the product. Not only that buying a game in early access can also often make you run out of content to play and thus not really contribute all that much to providing feedback through your gameplay. You stopped playing after a week or so = no more data. For the developer they are given little incentive to actually finish the game on time or at all simply because they already have your money. I'd say avoid early access on anything that isn't PC. PC is still trying to figure it out with many early access games that likely won't finish and a precious few that are slowly updating. @mjc0961 Well of course it should cost money because you're still buying a game. But if you buy early access you get all the updates and get the actual game for a lot less than the retail value. Should everyone avoid kickstarter games too because of that? They're obviously not getting anything when they fund the project yet they hope the developer will finish the game and that it will be good. So releasing a game for free and providing updates in content till the final release isn't good for the developers. There needs to be a happy medium between, and once again I state that early access isn't for every game. And if you think it's dumb then simply don't join in. Problem solved. I'm indifferent to early access, but I generally like free demos and think they are a good way to generate interest in a game, so I think the recent [email protected] promotion was pretty cool even though I didn't have a chance to take advantage of it. Personally, I have a huge backlog of full retail games and eshop games plus many upcoming games that I'm super excited for, on both Wii U and 3DS, so I'm not exactly scrounging for games to play. Ooh, didn't the Fire Emblem Awakening demo come out a month or so before the retail release? That's not exactly early release as you describe it in the article, but it succeeded in generating buzz for a successful retail release, I think.